Yes, “Towers”. Human towers. Towers built out of humans. As preposterous as this sounds, it was simply amazing. For a moment, cast aside your inhibitions, your taint for public or personal safety. You are in Spain, the land of the fire run, and multiple sports involving deadly bulls. And so, get amongst it. If you see a falling child, catch her. If you see a falling man, run away. If you can. 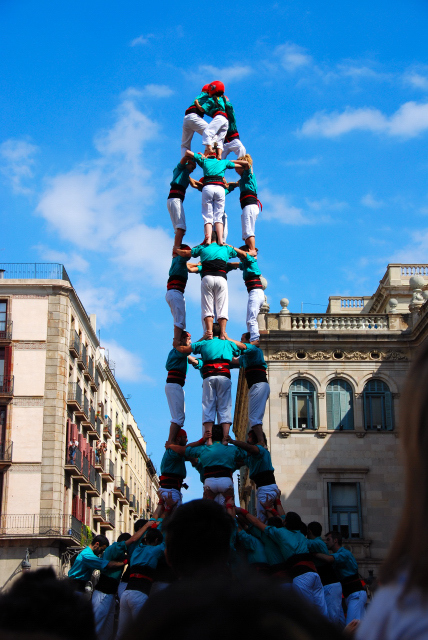 In Spain, these bio-buildings are called “Castells” and what you are witnessing here is the final. The best teams compete to see who is the best of the best in the heart of Barcelona during the final day of the festival. And, whilst my definition of success in such things is “getting out alive”, I suspect that there are other factors involved.